Islamabad Medical Center is located in Mehran Plaza, Karachi Company, G9 Markaz, Islamabad. It is an excellent medical facility in Islamabad. 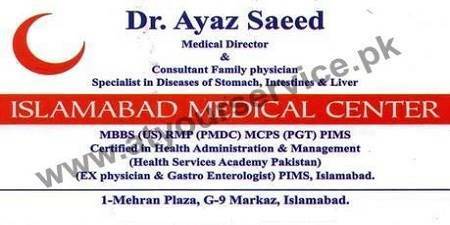 Dr Ayaz Saeed is the Consultant Family Physician and Specialist in diseases of stomach, intestine & liver.